I have a friend who is dedicated to eating nutritious foods and she is great at creating healthy recipes. I just love looking at every recipe that she posts! Although I have never yet made one, because I am waiting for Limi to go out of town or something, to spare his meat-loving self, I am excited to start eating more of the things she posts on her blog! 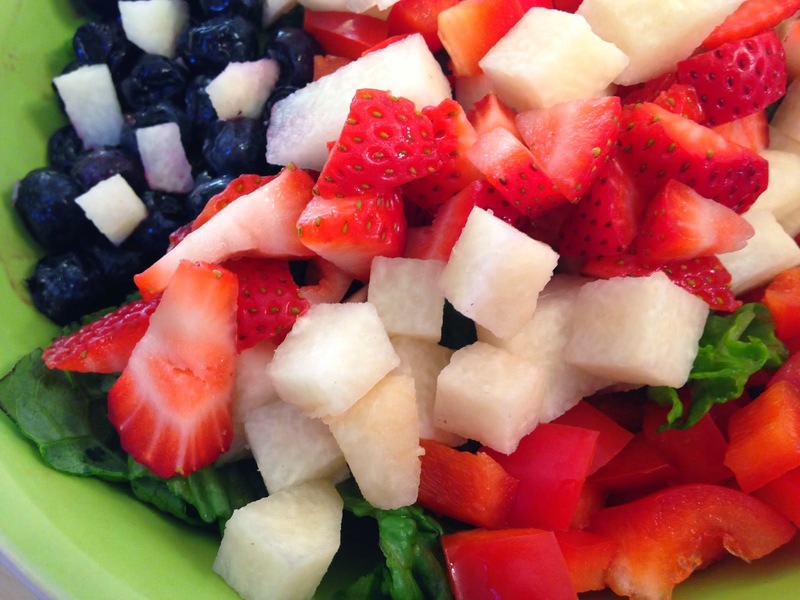 I know the 4th of July is only hours away, but when I saw her recipe for a Red, White and Blue Salad I LOVED it and had to post it to my blog as well! So many Independence Day recipes are centered around sugar and junk, but this recipe just goes to show that we can still eat patriotic foods in a healthy way! As you can see from the picture, she included strawberries, blueberries, red bell peppers, jicama and romaine, but she also has a great blue dressing to go on the salad! Be sure to check out her recipe here!